The last film from Miyazaki is not a fantastical action-adventure tale that joins the ranks of Porco Rosso, Laputa and Princess Mononoke. It is not a touching, coming-of-age journey to join Spirited Away and Kiki’s Delivery Service. The Wind Rises (Kaze Tachinu) is an entirely realistic, historically-inspired, fictional biography of Jiro Horikoshi, the acclaimed Japanese aircraft engineer during World War II. While it may be partially regrettable that another entry in either of those two aforementioned Miyazaki-mastered genres is not likely to be made, this film is not in any way a disappointment, rather it is a radical triumph and potentially his most narratively complex work. While masterful in the many ways expected of a Miyzaki feature, the film’s most unique strength is that it manages to convey deeply complex themes through a series of narratives that are elegant in their pacing, touching in their melodrama, but heavily haunted by their context. It’s an eerie, heartbreaking, and wonderful movie. The plot of The Wind Rises is not so inherently complicated or unusual, though. 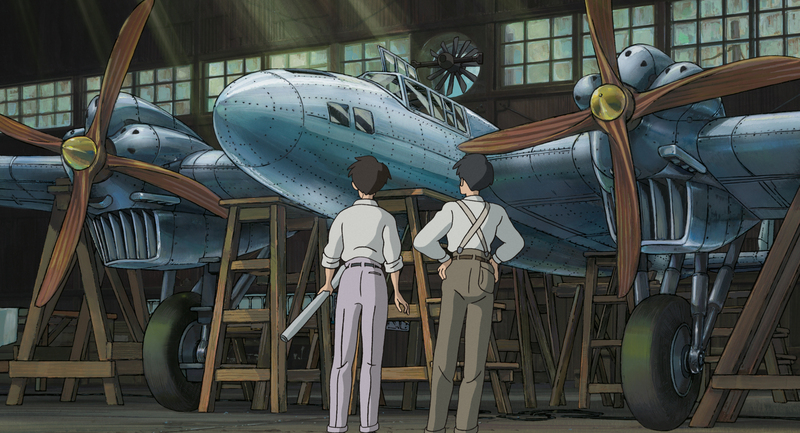 Jiro Horikoshi grows up with a passion for aircraft and after meeting Italian Aircraft designer (and personal hero to Hayao Miyazaki) Gianni Caproni in a dream, decides to become an airplane designer himself. The film traces his journey to Tokyo for engineering school, where he encounters the Kanto earthquake and meets his future lover Nahoko on a train. It continues then through the years of his career at Mitsubishi designing aircraft and his marriage with Nahoko. On the surface it is largely the story of “a devoted individual who pursues his dream head on,” just as Miyazaki stated in his proposal for the film (via LATimes). However, the film chooses to spend its time and focus on very irregular, seemingly small moments with regards to Jiro’s life as an engineer, leaving many of the larger events offscreen and unsaid. Instead of triumphant design breakthroughs we see minor failures of plane prototypes and discussions of flush rivets reducing drag. Instead of dwelling on the drama of whether or not Mitsubishi will land the big contract, we see a stoic Jiro working quietly at home while holding his wife’s hand. The film is full of these small, characterizing moments and chooses to leave many of the obvious plot milestones related to Jiro’s career simply implied. Additionally worth noting is that while the historical context of the political, economic and military events transpiring at this time eerily haunt many scenes, only rarely are they directly discussed. What this allows is for two other main narrative conflicts to come to the forefront: Jiro and Nahoko’s melodramatic struggle with the fact that Nahoko is terminally ill with Tuberculosis, and the quiet conflict within Jiro that while all he wants is to create something beautiful he cannot escape the violent context his creations are trapped in. The love story with Nahoko seems almost shallow and a bit contrived at a glance. The two bump into each other on a train right before the Kanto earthquake strikes. As it does, Jiro acts the hero in helping to save Nahoko’s family friend. They parts ways though, expecting to never see each other again. Years pass, and after a test flight of Jiro’s new design results in a devastating crash, he takes a vacation to a mountainside hotel where he fatefully crosses paths with Nahoko once more. Here they fall in love and despite Nahoko confessing her sickness to him, the two decide to get married. 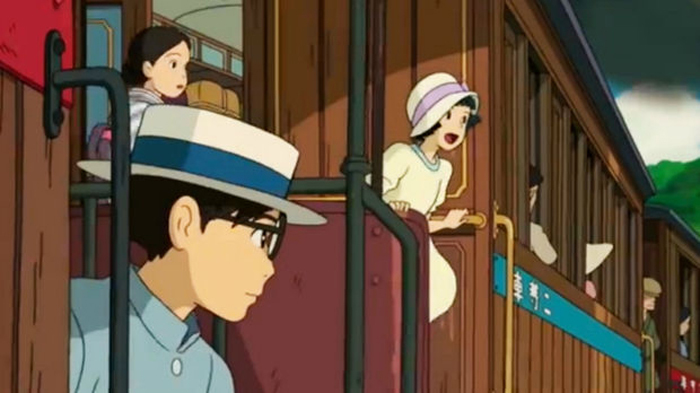 The film spends a great deal of time on these scenes in the mountainside estate, and the playful interactions between Jiro, Nahoko and her father allow us to see a much needed human side to Jiro’s life. It is also here that Jiro encounters Kastrup, an ambiguous character with complicated political ties and a strong belief that Japan’s political behavior is self-destructive. Kastrup aptly describes the mountainside hotel as a great place to escape sad things. For Jiro and the audience, this is a poignant observation. The seemingly too perfect love story now fits neatly into Jiro’s life and the viewer’s understanding of his character. While Jiro’s ambitions and stoic facade shield those around him from his complex moral struggle regarding his work, the one thing that is crystal clear and absolutely perfect for him at this moment is his love for Nahoko. Of course though, this all shatters sooner than Jiro would have hoped. Nahoko decides to leave the sanatorium, where she may have been able to survive her condition a few more years, in order to spend whatever brief time she has remaining alongside Jiro. Jiro, perhaps selfishly, supports her decision for them to be together. This part of the narrative is extremely meaningful in two ways. Firstly, it is significant as a meditation on the toll Jiro’s ambition for creation takes on his personal life. Jiro’s sister weeps at the thought of Jiro keeping his dying wife alone in a room at home all day while he continues to work his late hours, just so he can share a few short moments with her when he gets home. Secondly, though, it is Jiro’s love for Nahoko that seems to be able to keep him somewhat grounded and focused as Japan ever approaches war with America and the context of his work becomes all the more complicated. That complication is in fact the driving theme of the film and an immensely powerful one at that. 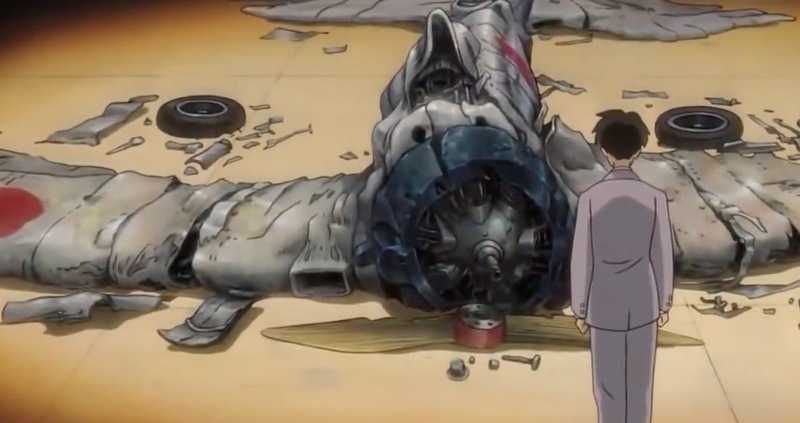 In one of the earlier dreams Jiro shares with the master Italian aircraft engineer, Caproni warns that while aircraft designers only dream to create beautiful things, they are forever cursed knowing their creations will always be used for murder and profit. Furthermore, Caproni overtly puts the question to Jiro as to whether he would prefer to live in a world with the Pyramids, implying the horrendous toll on human life they took to create, or a world without them? Caproni has confidently decided that pursuing his passion is all he can do, so he has chosen the “kingdom of dreams, the land of the dead,” and young Jiro seems to take the same course. However, the film elegantly presents the paradox Jiro finds himself in. It subtly leaks out hints that on the inside Jiro does have many qualms with the moral implications of his work, even if he is still too driven by passion and ambition to allow himself to stop in fear of those moral consequences. 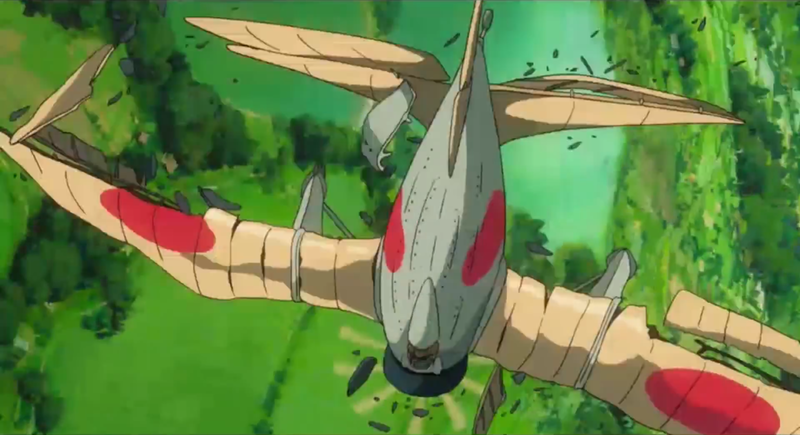 In a trip to the Junkers factory in Germany, Jiro remarks that the metal bomber would be better suited as a passenger plane and laments its inevitable use in warfare. At the mountainside hotel, Jiro seems very sensitive and open to Kastrup’s sentiment that Japan’s foreign policy seems self-destructive. When Jiro’s friend Honjo remarks on the irony that thousands of children starve in Tokyo while the government spends absurd amounts of money on military aircraft engineering Jiro is quiet, but there seems to be an underlying agreement. When giving a design seminar at Mitsubishi, Jiro reluctantly admits that one of his seemingly perfect fighter plane designs would indeed be perfect if it were not for the unaccounted weight of the guns that would inevitably need to be added to it. While all of his colleagues and supervisors laugh at the statement, Jiro himself retains a straight face. Lastly, throughout the film Jiro is haunted by brief visions of plane bombings, explosions, crashes and military destruction. While there is clearly much evidence of an internal conflict, Jiro still tries and largely succeeds to hide or even ignore this dilemma, and instead his stoic professionalism and the pursuit of his dreams carry him forwards. As Caproni says in the film though, “dreams are convenient,” because they let you do what you want and ignore the restrictions around you. In a way this is the perfect description of Jiro’s life. His focus on his career dreams is a device he is using to ignore both the horrifying reality of his wife’s impending death and the more serious moral and human costs of his work. It is such a human, yet complex conflict, both gigantic and relatable. The film presents themes that force the audience to ponder the role of careers, love and the many costs of creative work in their own lives, while simultaneously painting a historical picture of a very complicated time in Japanese history through the eyes of one of the most controversial figures of that time. Miyazaki executes on all of this so subtly, yet so powerfully, and in doing so delivers one of the strongest narratives in any of his works to date.